Alex has been able to see personified Emotions for as long as she can remember, and Revenge is her best friend. But when Forgiveness suddenly appears, he offers Alex a choice—getting even or moving on. It's impossible to decide when Revenge whispers in one ear . . . and Forgiveness whispers in the other. After reading and falling in love with Some Quiet Place last year, I was eager to read this companion novel. Just like the first book, it was a haunting and bittersweet read, but it didn't hold my interest quite as much as the first one did. Really, my only problem was that I had trouble empathizing with the main character. Alex is so bitter and so set on revenge that it was hard to care about her. Also, her family has been dead for many years, but Alex still acts like she's just now recovering from the grief. Of course it was awful to lose her family, but I would've thought she'd have moved on at least a little. The other thing about her I didn't like is how she constantly hurts the people closest to her and treats them horribly. I can't count how many times in the book I cringed because I felt so bad for Alex's aunt and uncle and her best friends. They were just trying to be there for her, and she kept pushing them away. Aside from Alex, I was really swept away by this book. As always, Kelsey Sutton's talent for writing shines through. Not only is she gifted at writing poetic, haunting prose, but she's also especially good with settings. She paints a beautiful picture of a dark and dreary town that I was completely lost in. I also loved the mysteriousness of this book. The plot had lots of big reveals and secrets. And of course, there are the amazingly inventive Emotions. They continue to be my favorite aspect in Sutton's books because they're so mindblowingly original. It's such a cool idea to personify Emotions, and Sutton weaves them into the story perfectly. I loved the roles of Revenge and Forgiveness in Alex's decisions. 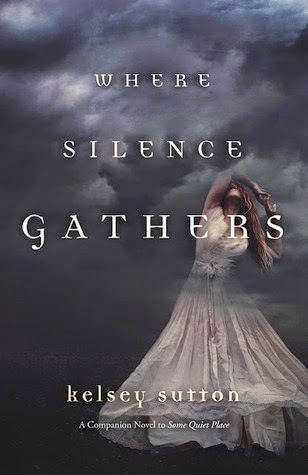 I didn't like Where Silence Gathers as much as the first book, mainly because Alex was so self-destructive and difficult to like. But aside from her character, I was blown away by this book. The author continues to improve in all the other aspects: gorgeous writing, well-developed minor characters, and an original plot. I can't wait to read whatever she writes next. I'm really hoping she'll continue this series; I can't get enough of the Emotions!